BPR, BPM and ERP | ERP the Right Way! I had a customer ask me about the relationship between BPM and ERP. Does ERP implement BPM or do you need to have BPM before ERP? Is an ERP implementation a BPR project? Who’s on first? As the ERP industry evolves it has become evident that additional disciplines like Business Process Management (BPM) and Business Process Reengineering (BPR) must be employed for a successful ERP experience. In the following blog posting I plan to define and demonstrate the roles that BPM/BPR play in the ERP lifecycle. Business Process Management (BPM) consists of methods, techniques and tools to design, deploy, control, and analyze operational business processes involving humans, organizations, applications, documents and other sources of information. Business Process Reengineering (BPR) is the redesign of business processes – and the systems, policies, and organizational structures that support them – to optimize the work flows and productivity in an organization. Enterprise Resource Planning (ERP) is integrated business software that supports multiple business functions across an enterprise. ERP implies the use of Commercial Off-The-Shelf (COTS) packaged software rather than proprietary software written by or for one customer. 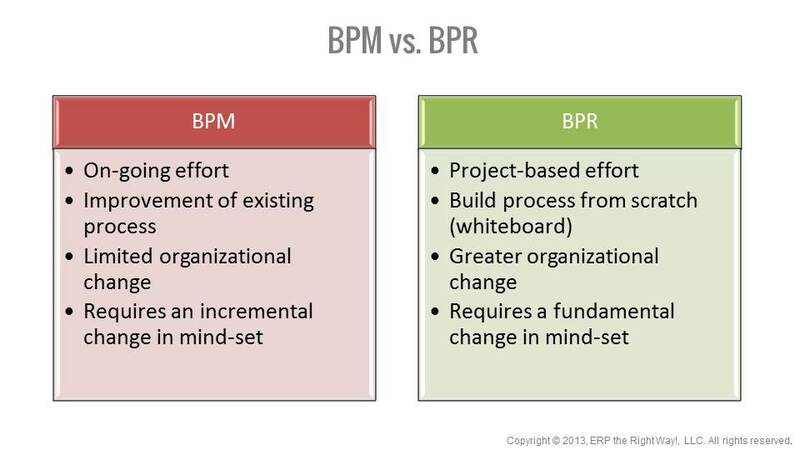 There are a couple of key concepts we should review to compare/contrast BPR and BPM. Allow me to provide an example. Company A performed a CMMI assessment of their purchasing process. Results from the assessment showed that the purchasing process was defined for certain business sales (revenue stream) but not for all purchasing events (direct & indirect). Another key finding was that there was no formal integration between demand planning, supply planning and purchasing which resulted in reactive purchasing. From the above CMMI reference, it was determined that Company A’s purchasing process is at the Managed level. Company A implemented several incremental initiatives (BPM) to improve process execution including documenting purchasing tasks for all purchasing events and conducting periodic purchasing planning meetings with operations. Enable Purchasing to have visibility across the entire supply chain to support a process-oriented management model versus a function-oriented management model. Implementing these changes will require a formal, projectized (BPM) effort that will redefine existing business rules, culture, and business process activities. As Company A continues to evolve their purchasing process they will conduct both BPM within the CMMI maturity level and BPR as they move to the next CMMI maturity level. 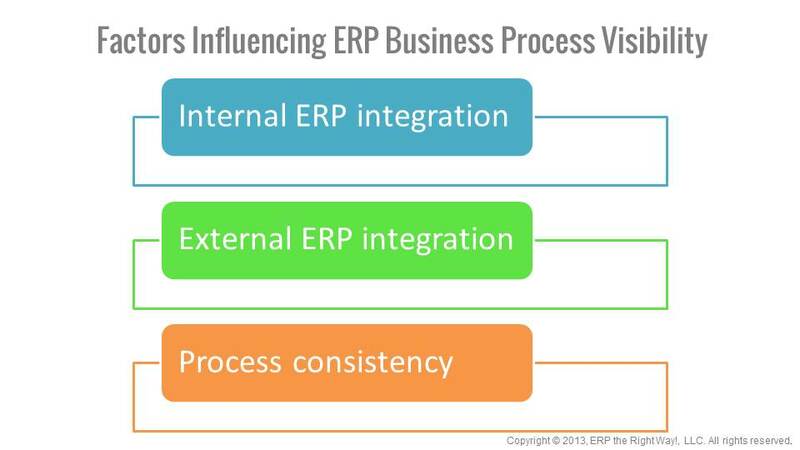 How Do BPR, BPM, and ERP Relate? ERP reduces the effort required to perform tactical business activities so customers can focus on strategic activities. Expanding on our purchasing example, this would include basic functionality like automating the creation of purchase orders, approving purchase orders, and matching purchase orders with receipts & supplier invoices. ERP provides the opportunity for visibility across business functions to support business process management. That said, there are several factors that determine the level of visibility. A competent ERP solution should provide robust, closed-loop integration between the functional modules provided out-of-the-box. As a practical note, there is always a need to integrate ERP to legacy systems and this requirement should be not overlooked. A business solution is only as good as its weakest integration. Process consistency will enable a relevant comparison of results and management of business processes. A mature ERP solution should provide automation and integration support for both tactical and strategic business activities across the CMMI model. I am a firm believer that business should lead and technology supports. Therefore, as the business model evolves it is important to identify the corresponding ERP functionality to support the business activities. This model also communicates that the best approach to implement ERP is to follow a logical maturity path for business processes. Allow me to address some common misconceptions and mistakes made during ERP implementations related to BPR and BPM. BPR is part of the ERP implementation. While I agree that the initial ERP implementation will result in major changes with existing business functions, BPR will not happen unless there is a concerted effort to redefine the holistic business model and organizational structure to be successful with the ERP software. Implementing ERP will give us BPM. The direct answer is no. ERP does provide an information foundation that can support BPM. 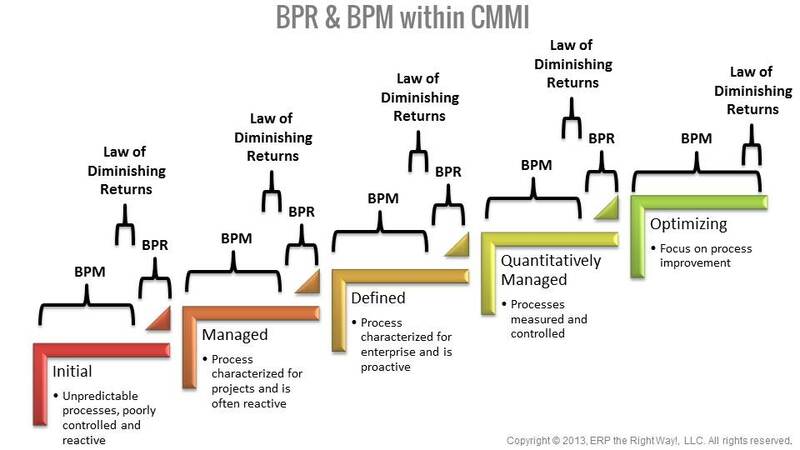 BPM is more about a discipline for managing processes and less about software. Do I need ERP to mature my business processes? Technically speaking, ERP is not a hard requirement for BPM. However, manual routine tasks and limited visibility hinder strategic activities. ERP can play a key support role in automating business tasks and provide visibility through integration. Should I implement ERP features that support business activities at different maturity levels? Customer expectations are not appropriate set regarding the limited value realized from mature ERP functionality due to less mature business activities supporting strategic activities. Example: A procurement process scorecard measuring standard Key Performance Indicators (KPIs) will have limited value if there is not a standard, enterprise procurement process. Implementation partners and business solution advisors should provide a short-term strategy and roadmap to evolve the supporting business activities to same level of maturity. This approach provides a “quick-win” opportunity for customers to drive additional value from the existing ERP investment. 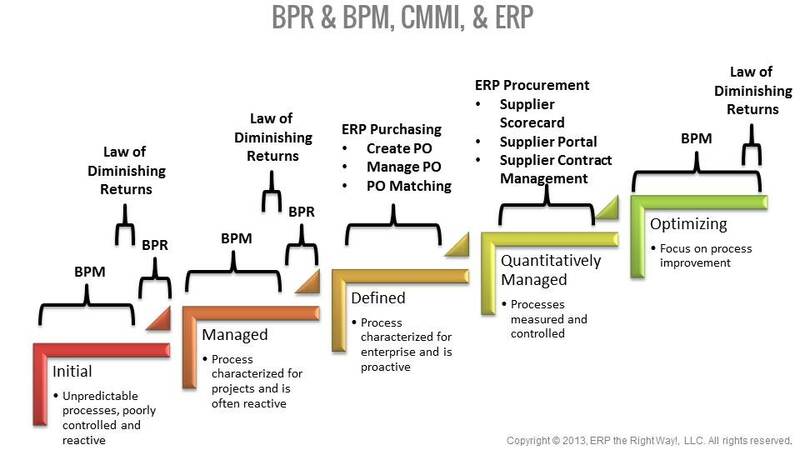 Understanding how BPR, BPM, and ERP should relate to one another can be a challenge. Some believe that it is an “either or” proposition. I do not subscribe to this school of thought but rather believe that BPR and BPM are disciplines that should be interweaved as part of your ERP application strategy. 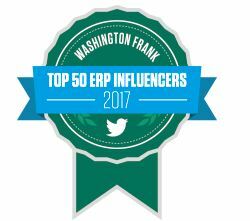 Knowing and appreciating these interdependencies will put you in a better position for ERP success. It looks like you spend a large amount of time and effort in writing the blog. Great post for information about the BRP, BPM, and ERP actually most of the time many people are confused between BRP, ERP and BPM.